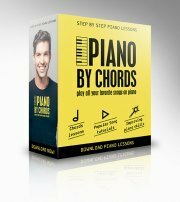 So, you want to learn how to move a piano without a professional help? Here is some useful information that will guide you through the way. But before I'd like to point out that paying a moving company is maybe cheaper but might save you money for damaged pianos and unnecessary injuries. Doubting whether you should move a piano on your own instead of calling the piano movers? Wondering what kind of piano moving equipment you'll need? Most piano weight comes from its cast iron harp that holds the strings. A small upright piano only weigh 300 to 400 lbs. because they have a smaller cast iron harp than big uprights or grand pianos. Big uprights run from 500 lbs. thru 800 lbs. (big player uprights can even hit 900 lbs.). Grand pianos run anywhere from 500 to 1200 lbs. What does a professional piano mover do to ensure a safe and successful move? With upright pianos, they almost always strap the piano on a skid called a piano board. They also cover the piano with blankets to help protect it. The entire bundle is then typically put on a dolly and taken to its destination. If steps are involved, the piano is taken off the dolly and slid up or down the steps on the piano board.So at end if you ask me How to move a piano inexpensively, I say you rather "HIRE A PROFESSIONAL" then do it on your own. How you do you find a good piano mover if you've decided to not try and move it yourself? My suggestion is that you call your local piano store and ask them for recommendations. They should be able to give you the name or names of reputable piano movers in your area. "you have no idea how helpful you are and easy to learn from!~Gem"
As with any moving company, be sure to ask prospective piano movers about their insurance coverage. In the vast majority of cases, the amount of insurance they carry will be more than enough to cover your instrument. If it doesn't, or if you'd like additional coverage, contact your home owner's insurance agent and ask about arranging for a rider to your policy that would insure the piano while it's being shipped. Occasionally, piano movers may attempt to "keyboard" a piano in order to move it: this entails removing the keyboard so that the piano can fit through tight spots. Let your mover know at the outset that you don't want this done. Bear in mind that some long distance piano movers won't come to your home. Instead, you'll be responsible for getting your instrument to your local piano dealer, and then the mover will transport it from there to a piano dealer near your destination. When your piano arrives at its destination, make sure that the movers place it somewhere where it won't be subject to major shifts in temperature - somewhere away from heating ducts, windows and doors. Even minor warping, caused by small temperature changes, can affect a piano's sound. However, if you're up for an adventure you might want to read this information on how to move a piano first before making critical (not to mention expansive) mistakes. If you want to learn how to move a piano yourself you must know it's a complicated thing! This article is dealing with an upright piano. Want to learn how to move a grand piano? I say, Do not try to move a grand on your own! Just imagine climbing up the stairs with it. I get sweaty here thinking about that. What you should do before moving a piano? Moving a piano without a professional help means that you have to give your friends clear instructions in advanced in order to avoid inflicting damage to them or the piano. A piano falling on your friend's foot is not a good experience for both sides. Read carefully through this article and make sure you have the equipment needed. 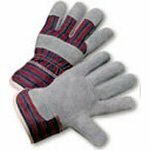 Work Gloves - Will protect your hands and avoid slippery hands. 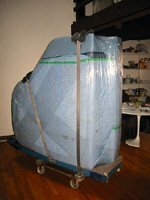 Plastic Covers - the most important part of moving a piano is packing it. In a nutshell, this means wrapping the piano in a series of Pad Moving Blankets so that the surface of the piano isn't scuffed or gouged (piano refinishing can be almost as expensive as replacing it). In many cases, a piano's delicate, internal moving parts will need to be secured as well. A piano board a small, indoor body board that can ease big loads down stairs with minimum turbulence. Strong, careful and reliable friends - who have no history of back problems. Lower the lid and lock it before you start moving. Make sure it is locked. Cover the piano with protective plastic cover to avoid scratches. This is especially important for means of transportation. Try to put your piano in an area of a room where there are little or no drafts, where it's out of direct sunlight, and where the temperature and humidity are stable. This is because pianos are sensitive to humidity and temperature. Lots of temperature and humidity swings cause a piano to go out of tune faster than normal, can damage the wood case, and if they are severe they can even eventually cause structural failure. Don't place your piano over or next to a heat vent and avoid putting it close to a fireplace. Don't put in front of a window because that's typically a draughty place as well as one with direct sunlight. Try to find a room in your home or apartment that has consistently stable temperature and humidity. That is the best room for your piano. Making sure the piano is moved in a way that avoids damaging bumps and scrapes is a piano mover's second most important task. Think about the way the piano has to cross while it is moved. Any narrow stairs? When a piano has to curve towards a new direction it needs some space to keep in mind in advanced. On the paper, a piano can enter where a human can. Its best actually to ask a professional in advanced whether it's possible or not. It's also important to make sure that the piano is easily accessible from all sides. 1. The piano should be always moved endways and not sideways. This can damage the internal workings. This can be beneficial for manoeuvring around tight stairwells or anywhere where there is limited turning space. 2. Carrying the piano is aloud only with wearing work gloves to protect the hands and avoid them from being slippery. A person should be positioned on each end of the piano for an upright piano and at least three persons around a grand piano, one at each leg. Let no one other than your assigned movers touch the piano. 3. The next paragraph will show you how to move piano without causing back strain. Do not bend your back. Lift you knees bent instead and keep you back straight in order to avoid severe back strain or injury. 4. How to move a piano without breaking the its legs? Be very careful to avoid putting too much weight on the legs. Get a few strong people to help if the piano is an upright. With an upright or spinet, tilt the piano back a little to take the pressure off the front legs, but be careful not to tip it back too far and tip it over. It's not necessary (and not recommended) to lift the piano off the floor entirely. 5. Do not strain the legs of the piano when you move it on carpeting or over a threshold. Spinets and console pianos for example have thin front legs that can break off easily if caught. Tip the piano back very slightly as you roll it to avoid damage. 6. Take your time. Move the piano only a few inches at a time. Make certain that the piano won't tip over by being pushed over any obstacle too fast. 7. Take enough weight off the casters to make it roll more easily, but do not lift it off the floor. 8. Make sure you lift the casters over bumps in the floor, one leg at a time. 9. Describe the way the piano should go through in details. If it's possible walk it with your friends so they can see it in their own eyes. Plan in advanced and let your friends know what they have to do at each step and don't spare them from any safety guidelines. Steps, carpets and other obstacles should be mentioned here. 10. Assign a friend of yours to hold of the handle behind the piano all the time while the piano is rolling. 1. Lower the lid and lock it before you start moving. Make sure it is locked. 2. Cover the piano with protective plastic covers. 3. How to Move a Piano with a Heavy-Duty-Dolly? Whenever a four wheel piano dolly can be used to transport the piano - muscle power on the part of the crew to move it - is reduced to almost nothing. This is because all of the piano's weight is centrally supported by the dolly. A piano properly balanced on a dolly is almost weightless and easily overcomes inertia on level surfaces. The dolly can be used to move a piano over level ground or on inclines and ramps or for tipping it up or down to get over a curb or 1 step. 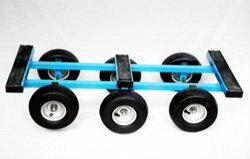 The piano dolly also can be used to roll the piano over plywood or Masonite to traverse grass, cobblestones, gravel, sand or any other slightly uneven or loose surface. When doing this though always use at least 4 or 5 people to push it and to rotate the plywood or masonite (from behind to in front of the piano). If the piano is mounted on its side, the heavier case of the piano should be balanced in its whole and just a bit of the side of the lighter(but none of its legs) supported by the dolly's rubber cross slats. The piano could also be mounted on its feet. In a centred position the dolly should juts out a bit in front of the piano which is how it must be in order to balance the piano's lighter keyboard weight as well as its heavier case weight (which contains its heavy cast iron harp). On inclines or ramps you will notice how heavy the piano is on the low end of the incline. On flat ground ends it might seem weightless on the dolly. Use at least three friends of yours when moving even a small piano because one man has to control the light side and two men need to be positioned on the heavy side of the incline to handle this weight expression. 4. How to Move a Piano Through Stairs? 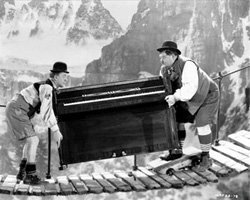 If you have one step in your moving path (and not more) then you better stable the piano on the dolly standing on its feet. Use a towel when you tip the piano to hold it from touching the ground and then stable it on the dolly as has been mentioned before. It is possible to move you upright piano over one step by using a slight tip of the piano on the dolly up / down as it is being pushed along. Use the hump strap to lift one end of the piano on the dolly (welded together as one unit so to speak) over the step. What we actually do is cheating gravity out of one step of carrying effort. In that way we don't have to remove the piano from the dolly and put it again. That's why it called cheating. This cheat work only for one consecutive step with an upright because the bottom edge of the piano (on the low side of the tip) will scrape the ground chipping it. Also the angle of tip can become too much to keep the piano in balance on the dolly. Step padding should be done here to be certain to not damage the piano's bottom edge or the edge of the landing. In order to do bigger cheats (up to as many as four consecutive low steps or as many as three consecutive higher steps at any given point on your move path) you must tip the whole upright up / down the steps by lifting it up and over the top step or lowering an upright down onto to a dolly or sliding the grand down onto a dolly. For two, three, or four steps cheats up / down the stairs, the upright piano is first placed on its side on the dolly. Then, with the bottom of the upright facing the steps, it is positioned on the dolly up to and (if possible) over the first step in order to cheat the first step by the height of the dolly as the piano's bottom is butted up to the side of the second step. When the tip begins on this three step cheat you should balanced the upright piano's case on the first step, be careful not to let the weak leg touch the stair so as not to break it. Then extricate the dolly from under the bottom side of the piano and place it between the piano and the stairs to protect its bottom and to expedite the dolly remount at the top of the stairs. Then finish cheating the other two steps by tipping the piano forward onto the dolly and then up and over the stairs to be traversed. If you have just one more step to traverse you wouldn't be able to push the upright up on the dolly over the edge of the landing. Instead of using the dolly as a buffer just lay the piano on its bottom all the way up to the top step. Then use a pad or some cardboard placed as a covering between the piano and the edge of the landing (to prevent scraping abrasion to the piano's bottom edge or undercarriage). Tip it up and finish by pushing it up and onto the landing. This same process is reversed when coming down the stairs. The piano is slid out to the two bottom men and they tip it towards the steps and lower it down once its out enough. When it finishes it's descent onto the bottom step it can just be further tipped right up onto the dolly. Again use a pad or a piece of cardboard as a buffer between a fine piano and the landing and the bottom step. These cheating techniques are so much easier than having to get under the piano and actually carry it over these few steps. 5. How to Move a Piano in a Truck? The upright piano should be placed on the truck with its keyboard side padded facing the truck's wall so that if it gets scraped it only happens on the backside which does not damage the piano's finish. The front keyboard side is protected by their pads. Never truck a piano on its dolly because it might break loose and roll around in the truck causing terrible damage while it's being driven. Once you arrive at the destination and are safely parked, the upright piano is unbelted from the truck wall and remounted up on the dolly, again on its feet or on its side depending on the aforementioned 4 consecutive low steps rule. Then ramp it or lift gate it down to the street. Next, the piano is dollied and cheated and / or carried (as circumstances dictate) over stairs to its destination point. Then it is dismounted from the dolly, being careful not to nick or chip the piano's bottom edge or the floor by using pads as buffers, and it is set in place (if possible into cups for the casters so as not to gouge the floor in the future). Bottom line, now that you know how to move a piano you know that piano moving includes a lot of planning in advanced, enough human power and a good improvising and thinking crew. If you choose to go for it be careful and take your time!